Well the description of the series was pretty vague, but it's not like I'm gonna sleep at 2am so I gave it a shot. Here's my overall breakdown. Awesome character designs: Frikkin adorable, I tell you hwut. Dat Engrish: Errrrrmagad it was cute. The first episode was basically just setting up the rest of the series, I imagine, which is why it seemed to drag. Really high hopes for this series and hope to cringe in delight at how cute it is many more times to come. So I'm five episodes in, and what can I say? This anime is fantastic. I've seen lots of moeblob anime and slice-of-life stuff, but a lot of it simply regurgitates the same old jokes over and over. This one's different. Sure, it fits the mould of its genre, but it has an interesting extra angle: the differences between Japan the West (in this case England). As a student of Japanese, I'm able to appreciate some of the wordplay jokes in the anime, but this may not be the case for everyone. Also, I should note that it's got a ton of suggested/implied yuri, though it doesn't seem to have any explicitly lesbian characters (such as in Yuru Yuri). if you love cute anime, this is a must-watch. Look no further! 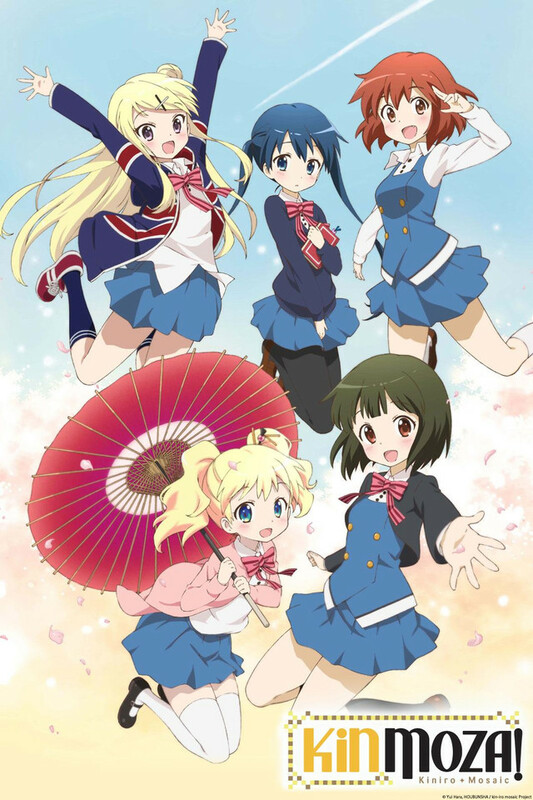 This anime is meant for relaxation and peace as this shows the adventures of 5 cute highschool girls and their lives in Japan, 2 of them being foreigners from England. The adorable and amazing characters are somewhat like Acchi Kocchi, as the cute, enjoyable, and comedic atmosphere flows throughout the 12 episodes. If you have the time, this is one to watch! oh my goodness its so kawaii! After watching the first two episodes I can safety say my cuteness itch has been scratched. Now the first episode was ok, kinda boring but episode 2 is where I was sold on this show. Now its not one of the best shows from this season (summer 2013) but it looks like its going to be the cutest. If you are looking for a new cute girls doing cute things anime you found it. MOE MOE KYUN!!! Great series, loved it from end to end. I liked it, but my 8 and 9 year old kids loved it. My Daughter is very upset that there's no more. I don't know if I'd let my 15 year old daughter go to Japan indefinitely to see a friend, though. And why did Shino go to England to visit Alice in the first place? I wouldn't have minded a few more details. From start to finish not a single disappointing episode. In fact, every episode surpassed my expectations. Now, of course don't expect some sort of deep plot here. This IS slice of moe life after all. But, there is a lot of development between the characters as the show goes on. The show never really goes into the "highly emotional dramatic turn of events" that so many of these shows tend to see at some point. There's one episode that gets close, but it doesn't really do so. And I think this show made a good choice in that. It always maintains being cute, comical, and all around uplifting to watch. You really never will lose your smile throughout~ There's also quite a bit of yuri undertones, as well as one character that is definitely looking for a romantic relationship with one of the girls. Poor girl can't work up the courage to say so though Do your best!! Anyway, the first episode opens up with a surprisingly moving episode, it's really amazing, but that does tend to give some people the wrong sort of expectations of the sort of show it'll be. I still think this show is a cut above other Slice of Moe Life shows, but the opening episode gives a bit of a different feel than you'll get throughout the main show. And the finale...just...pure brilliance. I won't spoil it, because it's a real amazing treat! Every season I look for a little slice-of-life just to take the edge off, and KINMOZA is this season's go-to series for me! The friendship between two very different families--one English and one Japanese--blossoms into a deep personal friendship between their daughters, Alice and Shinobu, as each takes a turn living with the other. All the usual cross-cultural situations come into play, but are deftly woven into a humorous interpretation. Culture shock, homesickness, and the confusion of trying to translate a studied language into actual speech are rendered both hilariously and poignantly. Perhaps the biggest treat, however, is listening to Japanese voice actors as English characters speaking English. The resulting Engrish is simply too cute for words! Three more girls have strong parts rounding out the group, and I'm counting on them all to continue to amaze and enchant! KINMOZA shows the cultural differences between two countries England and Japan. During the first episode I kept thinking about how the plot would unfold since the girls barely spoke each others language. However after finishing episode one I can say this anime has potential. If you are interested in slide of life comedy animes this is a must watch for you, hope you enjoy.